Indira Gandhi was born on November 19, 1917, in Allahabad, India. Gandhi was born into the politically prominent Nehru family; her father, Jawaharlal Nehru, served as India’s first prime minister. Gandhi served three consecutive terms as prime minister, between 1966 and 1977, and another term beginning in 1980. In 1984, Indira Gandhi was assassinated by her Sikh bodyguards. The only child of Jawaharlal Nehru and the first prime minister of independent India, Indira Gandhi was born on November 19, 1917. A stubborn and highly intelligent young woman, she enjoyed an excellent education in Swiss schools and at Somerville College, Oxford. After her mother died, in 1936, Gandhi became something of her father's hostess, learning to navigate complex relationships of diplomacy with some of the great leaders of the world. Gandhi was elected president of the Indian National Congress in 1960. After her father’s death, Gandhi was appointed minister of information and broadcasting. When her father’s successor, Lal Bahadur Shastri, died abruptly in 1966, India’s congress appointed her to the post of prime minister. She surprised her father’s old colleagues when she led with a strong hand, sacking some of highest-ranking officials. Gandhi subsequently brought about great change in agricultural programs that improved the lot of her country’s poor. For a time, she was hailed as a hero. In 1971, the Pakistan army conducted violent acts against the people of East Pakistan. Nearly 10 million people fled to India. Gandhi invited the Pakistani president to Shimla for a weeklong summit. The two leaders eventually signed the Shimla Agreement, agreeing to resolve the dispute of Kashmir by peaceful means. Her work eventually led to the creation of the new and independent nation of Bangladesh. Gandhi also led a movement that became known as the Green Revolution. In an effort to address the chronic food shortages that mainly affected the extremely poor Sikh farmers of the Punjab region, Gandhi decided to increase crop diversification and food exports as a way out of the problem, creating new jobs as well as food for her countrymen. Despite these advancements, Gandhi ruled with an authoritarian hand, and corruption boiled within her congress and her national and state governments. In 1977, the high courts found her guilty of a minor infraction during the year’s elections and called for her resignation. Gandhi responded by requesting that the president call for a state of emergency. Gandhi lost the next election and was later imprisoned. In 1980, the country responded differently and she won by a landslide majority. That same year, her son Sanjay Gandhi (b. 1946), who had been serving as her chief political adviser, died in a plane crash in New Delhi. 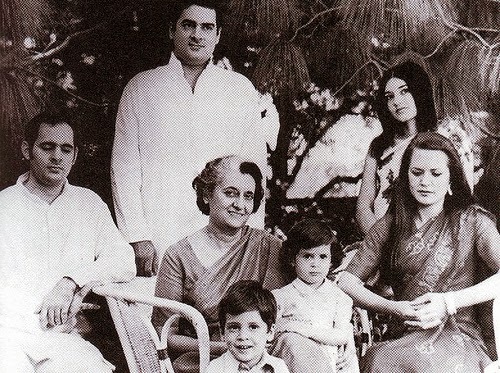 After Sanjay's death, Indira prepared her other son, Rajiv (b. 1944), for leadership. During the 1980s, a Sikh separatist movement developed in India, which Gandhi attempted to repress. Sikh extremists held a campaign inside the Golden Temple, and Gandhi ordered some 70,000 soldiers to purge the sacred space. More than 450 people died. On October 31, 1984, a trusted bodyguard, who was a Sikh, pulled out a .38 revolver and shot her point-blank. Another bodyguard, also a Sikh, then took out an automatic weapon and shot 30 rounds into her body. 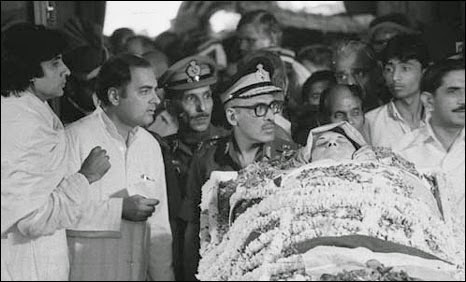 Indira Gandhi died on the way to the hospital.